Abigail Stecker Romero represents businesses in complex commercial litigation matters and labor and employment disputes. She has extensive experience defending clients in class actions brought under the Fair Credit Reporting Act and Telephone Consumer Protection Act, among other consumer-protection statutes. Abigail also regularly defends businesses faced with individual discrimination and wrongful termination lawsuits. Abigail has litigated numerous matters in trial and appellate courts throughout the country on behalf of clients in many industries, including banks, alternative lenders, telecommunication companies, and chemical companies. Startups frequently need to bring on manpower but do not have a human-resources department to help with identifying, interviewing, and hiring additional workers. Instead, someone with little or no background in human resources often finds themselves taking on that responsibility. 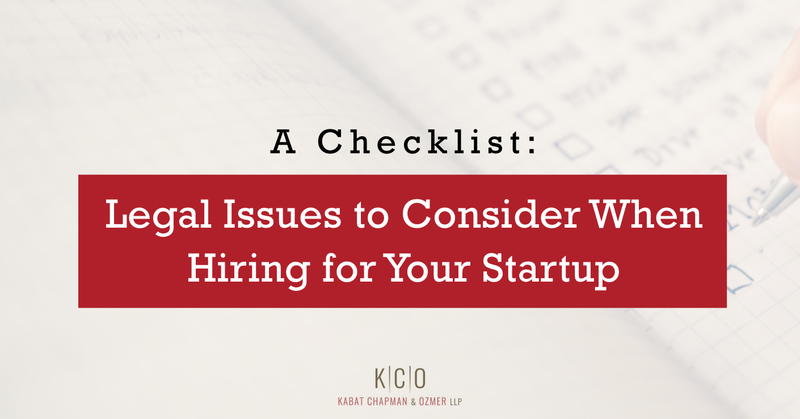 This post will help startups and small businesses identify and avoid common legal pitfalls in the hiring process. Most employers initially screen job applicants by reviewing a summary of the candidate’s background, such as a resume or application form. An employment application is typically superior to a resume because (among other reasons) resumes are designed to emphasize an applicant’s positive traits and may hide or exclude negative information about the applicant. Well-designed employment applications, on the other hand, will require applicants to provide information, whether positive or negative, on topics of interest to the employer. Applications provide the added benefit of asking for the same information from all applicants, which will allow you to make objective screening decisions based on inquiries that are actually relevant and meaningful to the open position—greatly enhancing the effectiveness of the screening process. While your application should be tailored to your business and the available position, it should not seek information that identifies, or suggests a preference for, candidates of certain protected categories such as race, color, gender, age, sexual preference, national origin, disability, or religion —otherwise, you may run afoul of Title VII of the Civil Rights Act of 1964 (or other laws). For example, the application should not ask the job candidates to disclose their age, or even when they graduated from college. Instead, the application should ask the candidates how many years of college they completed and what (if any) degree they obtained. The same is true for advertising the job opening, whether it be on your own website or others like AngelList, TechCrunch, and LinkedIn: do not include any language that could be interpreted as seeking, or having a preference for, candidates of a certain race, color, gender, age, sexual preference, national origin, disability, or religion. For example, you should avoid advertisements for “recent college graduates,” which could show a bias against hiring older candidates. After gathering a stack of resumes or applications for your business’s open position and screening the candidates, the next step is bringing select candidates in for interviews. You should use the interview process to learn about the candidate and to help determine whether he or she would be a “good fit” for the position and your company. Following the 80/20 rule is a good goal for interviews: the candidate should be talking 80% of the time and you should be talking only 20% of the time. Once again be careful to avoid asking questions that suggest you are considering (or that create the appearance that you considered) a job candidate’s race, color, gender, age, sexual preference, national origin, disability, or religion—as you may find yourself on the wrong end of lawsuits alleging violations of federal and/or state anti-discrimination laws, such as Title VII of the Civil Rights Act (or other laws). For example, to avoid the appearance of discrimination, you should not discard a resume simply because you disagree with the candidate’s religious affiliation or because it suggests he or she may have a disability. Similarly, during an interview, you should not ask questions designed to reveal the candidate’s age, religion or sexual orientation. Should you have concerns about how to conduct the selection process, you should seek the advice of legal counsel. Once you have identified the candidate(s) you would like to hire, you should run a background check on the candidate(s). If you do so, the federal Fair Credit Reporting Act requires (among other things) that you make various disclosures to the job candidate and obtain his or her authorization before pulling the background report. In addition, if you end up deciding not to hire (or need to subsequently fire) a candidate based on information you learned in a background report, the Fair Credit Reporting Act requires you to provide additional “adverse action” disclosures. Given the detailed legal obligations tied to the required disclosures (as well as the stiff penalties for violating the Act), you should be very careful before using generic disclosure forms to conduct background checks. Once you have decided who to hire, you will need to determine how to classify the new hire (employee v. contract worker), as each classification comes with unique legal responsibilities. Most workers are employees, meaning they are economically reliant on the employer regardless of their skill level. Employees may be paid a myriad of ways, including hourly, salary, commission and piece rate, and may be hired on a full-time or part-time basis. Depending on the size of your business, you may be required to comply with the Fair Labor Standards Act and related laws, which regulate minimum wage and overtime payments (among many other requirements). In contrast, independent contractors (or freelancers) are in business for themselves and are not typically economically dependent on the employer. Importantly, independent contractors are usually highly-skilled and provide their own supplies and workplace, unlike employees. Misclassification of workers as independent contractors, when in reality they should be classified as employees, may result in litigation, government audits and steep penalties. If you would like to lock down a worker for a set number of years, consider entering into a contractual agreement that clearly defines the nature and duration of the employment relationship. These agreements are most commonly used with high-level executives or in highly-competitive industries. However, employment contracts (and especially agreements not to compete or restrictions on post-contract activity) are highly complicated and should be carefully drafted to provide maximum legal protection to your new company. After staffing-up, you should also consider whether you need an employee handbook or written anti-discrimination (or other) policies, have obligations to post workplace posters for your employees detailing federal and state laws with which you must comply, and whether you are in compliance with a litany of other employment laws. If you have any questions about any of the above information or would like to discuss your hiring process, please feel free to contact us.